ResApp CS is custom-built software for elastic, prestress, partial prestress and non-prestress design of circular concrete reservoirs on the ground. ResApp CS is a wholistic, integrated and seamless software solution for the Professional Consulting Engineer. ResApp CS is custom-built for design, detailing and costing of circular concrete reservoirs on the ground. Wholistic integrated solution in a single project model. Rigorous elastic analysis of circular elements (wall, footing, dome) is performed using finite difference (FD) and finite element (FE) engines, customised for analysis of shells of revolution. 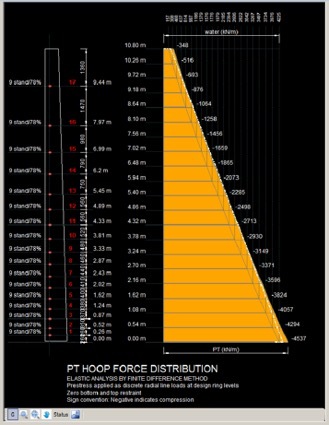 The analysis accounts for bearing shear stiffness, footing-soil interaction and footing radial stiffness. 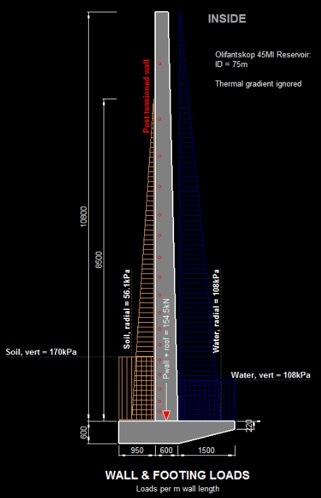 The footing is analysed as an annular beam-on-elastic foundation. 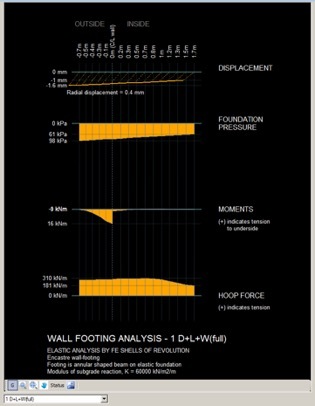 Supports modelling and analysis of tapered walls. Bonded internal post tension design and integrated detailing. Flexible option for partial prestress solution. Prestress design follows EC2 unified design philosophy. Elastic analysis of shells of revolution and prestress design of dome ring beam. 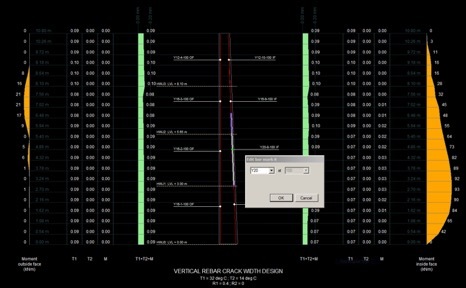 User-friendly, highly graphical interface including interactive graphics. 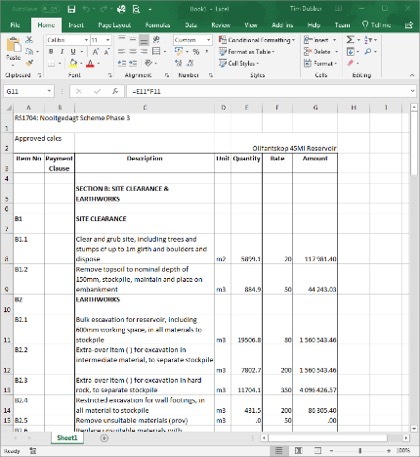 Create Excel format tender BOQ for costing. 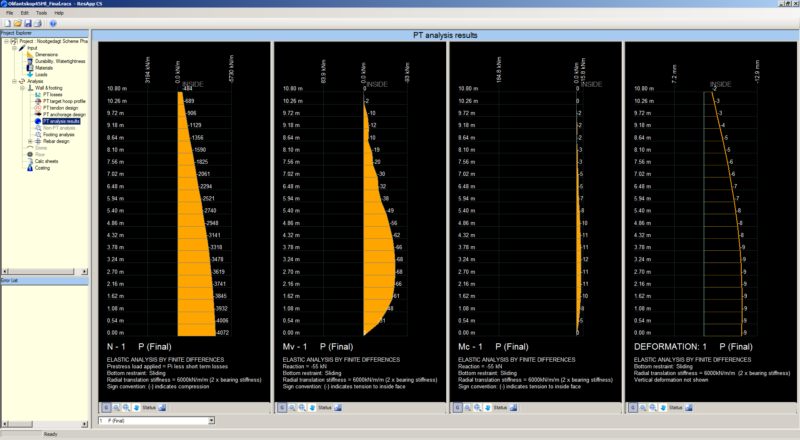 Shape-cost optimisation analysis offering significant build savings. Modular and flexible rental licensing. You pay only for features that you want. Res Spec is committed to on-going software development and user support. is a legal agreement between the end user of this product and Tim Dubber, the developer of the software product(s) identified above (“SOFTWARE PRODUCT” or “SOFTWARE”). By installing, copying, downloading, accessing or otherwise using the SOFTWARE PRODUCT, you agree to be bound by the terms of this EULA. If you do not agree to the terms of this EULA, the developer is unwilling to license the SOFTWARE PRODUCT to you. In such event, you may not use or copy the SOFTWARE PRODUCT. The SOFTWARE PRODUCT is protected by copyright laws as well as other intellectual property laws and treaties. The SOFTWARE PRODUCT is licensed, not sold. (a) On receipt of the order and full payment, Res Spec shall record the client information. (b) An invoice shall be generated for the order received. (c) Res Spec will provide instructions to the client to activate the ordered workstations after receipt of full payment. (a) Limitations on Reverse Engineering, Decompilation and Disassembly. (b) The SOFTWARE PRODUCT is licensed as a single product. Its component parts may not be separated. (c) You may not rent, lease or lend the SOFTWARE PRODUCT. (d) You may not sell or transfer ownership of the SOFTWARE PRODUCT in any form. (e) This SOFTWARE PRODUCT cannot be transferred to other End Users at other institutions under any circumstances. (f) Without prejudice to any other rights, the developer may terminate this EULA if you fail to comply with the terms and conditions of this EULA. All title and intellectual property rights in and to the SOFTWARE PRODUCT are owned by the developer. Product support for the SOFTWARE PRODUCT is provided by the developer, but is limited to telephonic, email and web based queries and is available only to users who have entered into a maintenance agreement with the developer. (a)With this document Res Spec makes and the clients receive no express warranties. Any statements or representations in this document or any communication with you about this document constitute technical information and not any warranty or guarantee. Res Spec specifically disclaims any other warranty including without limitation, any implied warranties. (b) In no event shall Res Spec be held liable for any incidental, special, indirect, direct, or consequential damages, loss of profits, revenue, data, or cost of cover. In addition, Res Spec will not be held liable for changes to this document or any of Res Spec’s policies. (c) Res Spec retains the right to change any clauses in this document without notice and with immediate effect. (d) All agreements in this document and/or any other agreements proposed by Res Spec and accepted by the client are governed by the laws of the Republic of South Africa. All disputes arising out of or in connection with any agreement as mentioned above shall be subject to the exclusive jurisdiction of and venue in the Supreme Court of South Africa, and the client irrevocably consents to the personal and exclusive jurisdiction and venue of this court. All sales are final. Once the client has made payment online, he cannot cancel the order or receive a refund. ResApp software is not released. RECEIVE NOTIFICATION OF PRODUCT RELEASE?